Picea (spruce trees) a group of evergreen coniferous trees with species including Picea abies, glauca, pungens (Colorado Blue Spruce or Blue Spruce) and sitchensis. This is another group of conifer trees that range in size from large trees to dwarf types, versatile in many landscaping situations and with some varieties such as P.glauca ‘Christmas Star’ now being widely sold as a living Christmas tree. Generally these are a slow growing tree useful in the garden as feature trees and also used widely as windbreak trees. 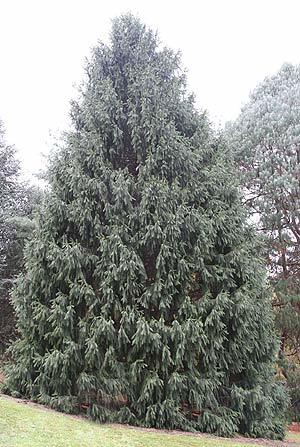 With many forms including the Dwarf Blue Spruce which is excellent for the rock garden and the Himalayan Spruce Picea Smithiana a large tree with weeping graceful branches, Picea are a versatile choice for the garden. These are a hardy group of plants although they do prefer cool summers with low humidity. They are widely grown through the southern states. The lower growing varieties seem particularly useful in landscaping where they will grow in light shade and are suited to growing in containers. Use them as specimen plants, as fillers in the border or as feature trees depending on the species and landscaping needs. Picea abies ‘Inversa’ – This is a mound forming plant, excellent as a ground cover or used on an embankment. Picea abies ‘Pygmaea’ – As the name suggests, a very low growing form, upright and a good container plant. Picea abies ‘Procumbens’ – Blue green foliage and a spreading low growing habit. Excellent in commercial landscaping projects as well as home gardens.